Of course a woman is behind some of the great inventions of our time. Bette Nesmith Graham for instance. 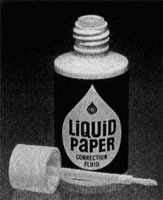 She invented Liquid Paper, originally called "mistake out". For 17 years she sold it from her kitchen-garage until in 1979 when she sold it to Gillette for 47.5 million dollars. 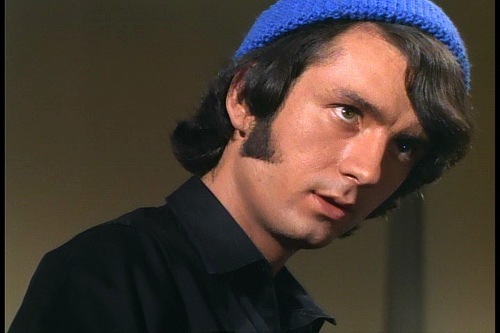 Did you recognize the name Nesmith? Bette was mother to Michael. Bette left half her estate to Michael when she passed in 1980 so we have her to thank in part for the popularity today of music video. Michael invested his inheritance in Pacific Arts Studio, a forerunner in the production of video music. I spent a pleasant morning a couple of weeks ago digging up old Nesmith songs & videos on YouTube. There’s some goodies… Joanne, Rio, Cruisin’, Different Drum, plus all of the good Mike Monkees’ songs. I met him in Dallas in the 80’s- he was doing a video signing for his “Television Parts” compilation. I will be singing ‘take the last train to clarksville and I will see you at the station’ all the way to my big girl job in the city…where I used gallons of white out back in the day when I fat fingered my manual typewriter. Geez that does not seem like that long ago. I think I have every Monkee album there is! However Mike was my second favorite. I was totally in love with Davy Jones! I was a huge Monkee fan back in the day! When I saw that your blog was about White Out, the first thought that came to my mind was “hey that’s Mike Nesmith’s mom’s invention! I so admire inventors. What an imagination they must have! I did not know ANY of that! How fun! I didn’t know that! So glad I found your blog tonight–I’m a vintage-loving girl, too. I’ll be back often to say hi & see what your up to…love all that vintage fabric I saw while scrolling down your older posts….yum! Smart people making smart and gutsy choices! This is a great post. OMWord! Knew about the white out, not about the son. You learn the darndest things blogging. Thanks!